A former Swansea City FC director has said he was "bullied and intimidated" into leaving the Premier League club, an employment tribunal has heard. 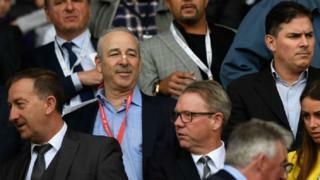 Steve Penny and fellow ex-director Don Keefe have claimed unfair dismissal and age discrimination after they left in 2016 when Americans Jason Levien and Steve Kaplan took over the club. Swansea deny the claim at Cardiff Magistrates' Court and say Mr Penny is trying to make money out of the club. Mr Penny was the club's legal director. Mr Keefe and Swansea chairman Huw Jenkins are also due to give evidence to the hearing, as is Mr Levien via video link. Mr Penny's allegation of bullying and intimidation is against Chris Farnell, the club's legal advisor since the 2009-10 season. In July 2016, Mr Levien and Mr Kaplan led an American consortium which bought a controlling stake of 68% in the club. A boardroom reshuffle followed, with American investors Robert Hernreich and Romie Chaudhari joining as directors and Leigh Dineen leaving the board despite remaining vice-chairman. This process also saw Mr Penny and Mr Keefe leave, along with fellow long-time director, the late Gwilym Joseph. None of the three were shareholders. Mr Penny initially refused to resign and alleges Mr Farnell "threatened" him and told him: "If we have to, we will get rid of you anyway." Swansea refuted the claim, arguing Mr Penny's grievance was based on a personal disagreement with Mr Farnell and the feeling Mr Farnell's legal firm, IPS Law, was getting more work with Swansea than Mr Penny's former firm, JCP Solicitors. Representing Swansea, Jamie Jenkins said: "You were keen for work to go to your old firm rather than Mr Farnell's firm. "The reason why you say Mr Farnell intimidated you was because you did not like him and he was taking work away from your firm." Mr Penny said that was "not true". He and Mr Keefe were a part of the local consortium which took control of Swansea in 2002. The tribunal heard Mr Penny was paid by the Swans as a director and consultant, earning a total annual salary of £100,000. Following Mr Levien and Mr Kaplan's takeover in 2016, Mr Penny continued to work with the club for a short period but says his role was "diminished". As he, Mr Keefe and Mr Gwilym, prepared to leave, Mr Penny said they wrote to Mr Jenkins to "put in a request for a bonus to reflect our collective efforts". But it was put to them in court: "This letter was not about your role but about your status and money." Mr Penny, 62, also alleges his departure was related to age discrimination, instigated by club director and shareholder Martin Morgan. "His view was that we three were past our prime," said Mr Penny. "I believe Huw Jenkins had the same view as Martin Morgan." Swansea has pointed to a lack of written evidence to support this claim and Mr Penny admitted his conversations with Mr Morgan were "not minuted". Swansea also refuted the age discrimination claim as 72-year-old Mr Hernreich was appointed as a director after Mr Penny's departure. "The only reason you are claiming age discrimination is to make money out of the club," the Swans's legal representative said. Mr Penny replied: "That's not true."